To test this theory, Willem Kuyken, PhD, and his team at Oxford University, first needed to come up with a safe and ethical protocol for working with participants having a history of depression. So, to test the notion of replacing medication with meditation, Dr. Kuyken and his team conducted a randomized, single-blind study among subjects who had experienced at least 3 episodes of major depression (and who were on a maintenance dose of antidepressants). All of the study participants continued their maintenance dose but half were selected to participate in an 8-week mindfulness based cognitive therapy (MBCT) course. Following the MBCT course, participants were given support by the licensed MBCT therapist and their own general practitioner to taper, or even completely stop their antidepressant medication. Over the course of 2 years, the researchers followed the 424 study participants and evaluated recurrence of depression and time to relapse. After 2 years Kuyken and his team reviewed the data and found no substantial differences between the maintenance antidepressant group and the MBCT group. Participants in the experimental condition showed significant reductions in symptoms of depression, anxiety, and experiential avoidance. These effects were sustained at the 3-month follow-up. The likelihood of a clinically significant change in depressive symptoms was notably higher within the MBCT group. While this might sound anti-climatic, these results actually support the claim that meditation could be equally effective as medication at preventing depressive relapse under the right circumstances. On the flip side of things, it’s important to consider the limitations of the study. While I appreciate that this was a single-blinded randomized controlled study, only subjects who were open to alternative treatment and possible medication reduction were recruited as participants. Additionally, not all of the subjects in the MBCT program decided to taper their medications. We also need to pay attention to the limitations of using a wait-list control designed study. Although wait-list participants don’t actively receive the intervention being investigated, it’s possible they could experience changes over time that aren’t accounted for within the study design. On the other hand, participants in the experimental group may have responded to simply being studied. I would like to see further research to investigate how mindfulness could support patients who wish to discontinue or supplement medication for depression. How have you supplemented medication with your clients using mind/body therapies? Please leave a comment below. I practice mindfulness every day, and have done so for nearly 11 months now. My medications has failed to change in dosage, and I’m led to believe I will be on medication for the rest of my life. Is my practicing mindfulness then a waste of time and energy? If it seems as though it is a waste of time and energy, than it probably is. Most people that practice mindfulness daily feel a sense of synchronicity, focus, internal growth, and balance that was not there prior. If it is something that soothes you, continue. I am still taking 20mg paxil, and having anxiety/depression flare ups often. The practice of mindfulness has made a significant difference in the frequency and severity of flare ups. I had been suffering from depression for years when I finally saw a psychiatrist who prescribed an antidepressant. Medications were changed with no significant change. I got interested in MBSR from reading Dr. Jackie Gardner-Nix’s book on mindfulness and pain management. I suffered also from chronic lower back pain, PTSD, anxiety and sleep disorders. The psychiatrist referred me to a wonderful psychotherapist who also is a mindfulness instructor. We started with MBSR and switched to MBCT and psychotherapy. I have found it to be a life changer. My relationship to my pain and my depression and anxiety have changed significantly. How I view myself and my problems have changed significantly too. I am a lot less depressed and anxious. I also use guided imagery audios for depression, anxiety, PTSD, panic attacks, and insomnia. I read all I can about aspects of psychology that affect me. I also read and listen to great meditation and psychotherapy teachers. The amount of help available on the internet is amazing! I am so grateful for the plethora of kindness and intelligence that is offered and available to those that seek it. NICABM and others truly benefit so many people by providing this information to professionals and non-professionals alike. I have not stopped my antidepressant yet, but I do have a goal of trying to reduce the number of medications I am taking. MBSR and MBCT helped me to wean myself off around-the-clock opioid pain meds. I feel I have my physical pain, depression, and anxiety under control and need to work on my insomnia. I still get physical pain, depressed moods, and anxiety but I control it rather than letting it control me. I wish I had learned of MBCT years ago. It would have helped in quitting smoking and in so many other ways. Perhaps I might not have been open to it then as I was recently. I recommend it to every health care professional I encounter and also to people who are suffering from problems that there is evidence that it can help (almost everyone). Many people who see me infrequently have commented on the change they see in me since MBCT. They comment that I seem happier, healthier, and more vibrantly alive — that I exude positive energy, happiness, and wellness now. I have been told that I look better — younger, thinner, etc. — even though I stopped coloring my hair and let it go gray. Mindfulness taught me that I am the author of my life and that how I feel is up to me, not controlled by outside forces and situations. Knowledge and practice are 2 different things though, but I am trying to be a happier person and not let myself feel helpless and despondent about things outside of my control. How I feel is within my control. This is a hard lesson to learn for someone with chronic or long term depression. It’s hard to take ownership of the problem and much easier to blame it on outside influences and want some magic bullet or pill to take the problem away. As the Dursleys told Harry Potter, “there is no such thing as magic”. I happen to believe in the magic of mindfulness, guided imagery, self-hypnosis, and energy-based therapies. Academically and professionally I was a scientist, so I believe in science. Anecdotal evidence isn’t scientific evidence, but can give scientists insights on which to base studies. I hope this is helpful. I work with new born and young children. I am a neuropsychologist and i believe – as the scientific evidence shows (does no show) that there is more danger to RX for the fast growing brain than any existing benefits claimed. In 39 years of work with this population, i have referred ZERO number of my kids for psychotropic medication evaluation/prescription for this reason. I teach meditation, mindfulness and relaxation techniques using various methods i know, to the parents/caregivers as well as to the young child as of 2 years of age, to work through their emotions. My rate of success has been heart-warming to me and the children’s caregivers. I think there is some truth in this but it’s also individual to what each person is experiencing and or processing. I have a history of complex trauma and have dipped into severe depression more times than I can count The last time I reminded myself when I feel the dip never to let it take me down as far again, but giving that I have comorbid conditions, it’s no plain sailing but if I could talk on depression alone (unfortunately it’s not that simple) I would say yes mindfulness and awareness have definite components in assisting a sufferer. Can the Kuyken data be accessed on the internet? I’m all for seeing further studies on this, as I truly think there is something significant here. Absolutely. Some thirty years ago, before meditation was an acceptable term at the college I worked at, I’d practice “Stress Reduction” with some of the college students in my student support program. Several of them were on prescribed anti-depressants which they did not like since, as I recall, it left them feeling numb, lifeless, emotionally flat. Over time and with practice, they gradually withdrew from their meds having exchanged them for mindfulness meditation practice. Ilt worked! They were restored and grateful. We also added physical activity to the “package”. Walking helped as did yoga, qigong, etc. Thanks for your courageous and intimate self-report. I only have myself to study. After 16 long numbing years on psychiatric medications, safely titrating myself off, the quality of my life with mindful practices continue to create the life I want to be here for!! I am a forty-year meditater. Though I have the care of a medical doctor, I have no doubt that the meditation has given me a great deal of health support. After 9/11/2001 I tbecame clinically depressed for the third time in my life. I had young children and felt the need to learn new skills to get off and stay off meds. I succeeded by using the Midwest Center’s program for Anxiety and Depression. At the time they did not use the word mindfulness but the program was definitely successful at rewiring my brain. Then in 2010 I needed brain surgery to remove a benign tumor. Despite all the tools in my tool box the trauma to my brain caused me to became organically depressed. I got off of meds with the guidance of my healing touch practitioner. She taught me various breathing techniques and then slowly introduced me to doing yoga nidra with various CD’s. I started buying programs from Souds True. Rick Hanson and Kelly McGonigal changed my life. I was now meditating. Then in 2014 I was diagnosed with Stage III cancer. As part of my recovery Siteman Cancer Center offered me a MBSR course. I take Qigong through the Cancer Support Community. 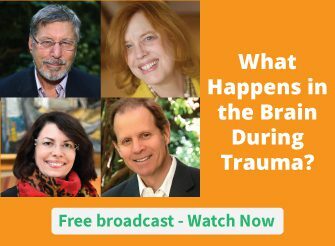 I take part in online offerings like the Mindfulness Summit now taking place. I am confident that no matter what life brings me I now have the tools to never need to take prescription anti depressants again. Wishing you well Bea in your life journey… Your story touches me very much. What I like very much is your stand and belief in the tools you have including mindfulness…All the best to you…. Wouldn’t leave home without ’em. As a former biofeedback specialist in a chronic-pain inpatient program, with the insurance companies continually reducing the number of sessions available to patients, I had to learn how to teach anger- and anxiety-management – two keys to pain management – and teach these skills FAST. The answers: slow breathing, energy-psychology assisted CBT, and nutrition education. Slowed breathing (you can find the resonant frequency with heart-rate variability biofeedback, but it is usually around 6 breaths per minute in average sized adults, faster in children, and it is effective enough to lower blood pressure at any pace below 10bpm) improves mood in mild to moderately depressed subjects and is key to reversing hyperventilation syndrome, one physiological aspect of panic and other anxiety states. Energy psychology: these days, I mostly use the tapping therapies (I like the rapidity of Daniel J Benor’s WHEE, combing alternate-side tapping from EMDR with affirmations and tearless-trauma techniques from Gary Craig’s EFT, though EFT has a more solid research foundation) for rapid relief from conditioned fear or rage. Back then, I combined thermal biofeedback with a heart focusing technique called The Comfort Cycle. A patient with dissociative identity disorder reported to me that by focusing on sensations at the center of her chest and keeping her eyes open, she could for the first time experience strong emotions without involuntarily switching personalities. (Heart heavy = depression; sense the heaviness and allow yourself to appreciate that you are doing so, and the heart sooner or later starts to lighten. Heart tight or cold = anger; tune into the sensations without judgment, appreciate yourself for doing so, and the heart begins to soften and warm as your thinking becomes less vindictive and more empathetic, forgiving, kind.) Nutrition – most Americans, voracious carbohydrate consumers thst we are, are deficient in one or more B vitamin and/or the mineral magnesium, all needed for neurotransmitter production and proper neuromuscular function. The tapping therapies work great to reduce the anxiety behind carb cravings, and a high quality multivitamin (plus magnesium citrate, or glycinate to reduce the risk of diarrhea) helps replenish. As a clinical psychologist since 1993, I realized that the practice of meditation through the therapeutic tools of yoga were much more beneficial than other modaties..especially the over use of pharmacecals in changing lifestyle habits of awareness. Medications have a profound effect on the respiratory system. I wish there was a study on the side effects and the effects on the physiology of the body effecting the brain function for the hypothesis. Breath work changes everything!! Calms the mind and the lipid system is no longer linked to flight or fright. I never start my clients with meditation since the minds lack of focus..breath work is the key. Yoga therapy has been doing this for thousands of years. As an accredited yoga therapist there should be more teaching of pychologists this important sciences. Thank you for sharing this information that can give us effective options for treatment. Although I have no experience with my patients, re MBCT vs medication, I fully believe that Mindfulness based meditation & other Mindfulness strategies will more than likely prove to be more beneficial over the long term. The study you presented, Ruth, was too limited in scope but an important first step. MBCT needs to be tracked for at least a couple of years after commencement, against antidepressant medication, to truly discern the long term benefits. Functional MRIs need to be carried out at the beginning & the end of no less than a 2 year study (& perhaps longer) , comparing medication vs MBCT. I fully acknowledge the ethical dilemma of research & as yet don’t know how to sort it out (but believe there’s a v. real solution). In1993, I was in a psychiatric hospital for 2 months and on Prozac for 10 month and receive pharmacotherapy only. 1999, I relapsed and have been on medication( ADM) like Rivotril, Desyrel, Zerzone Zeprexa, Zoloft, Wellbutrin, Remeron with bad side effects and monthly psychiatric supervision. dec 2005 , I found a psychotherapist wih PhD with 30 year of training in mindfullness meditation. I started in his 1-hour MBCT group training 12 week long, and 3 times per year + 2 intensive 2-day formal practice week-end. In total, 36 week per year. To me, mindfullness meditation ( MBCT ) save my life with no adverse side effect like those awfull antidepressant medication. Soo, MBCT with formal daily practice is better than medication. I have been praticing a daily practice 10 years NOW and I am 68. Better to meditate than medicate. The world continues to explore the meaning of a a peaceful and meaningful life. I think is a very worthwhile field of research to compare these two groups of participants. For some people antidepressant medication is not tolerated very well physically and they experience feeling ‘numb or weird or like a zombie’ and or feel like a failure or stigmatised being on medication. This can lead to anti-depressant medication being abandoned suddenly or just when the person’s moods are stabilising and they can return to self-medicating with other medications, drugs and other nefarious habits or drifting into dangerous states again. I read this article and the results with a very keen personal interest as i have a diagnosed illness of Major Depressive Disorder with 3 major depression episode. Being on a high maintenance dose of anti depressant medication for the past 5 years, I have often wondered if meditation, and for me that would be the Word of God as I am a very committed Christian, could replace the medication. My physician and psychiatrist have been reluctant for me to do this despite originally stating that once stabilized I could gradually go off the medication. Obviously it takes a lot of work to practice meditation/mindfulness and it would need to be as regular and ongoing as medication would have been. It would be very interesting to know if the participants continued to display those results over a longer period of time. Rhonda, it does not have to be a huge deal. You can start simply. See http://mindfulnessandpresence.net for details.